As you know, we have two scholarship programs, National and Opportunity, and thus two Scholar Facebook communities. These FB groups are to provide support and connect you with each other, on campus and around the country! We have decided to combine all our Scholars under one group, “TheDream.US DREAMer Scholar Community” so that all Scholars can benefit together from what is shared – information on DACA, applying for jobs, Scholarship events, and sharing experiences and networking. Please keep in mind: some of the posts and content shared will be information pertaining only to National scholars or to Opportunity Scholars. As you read posts, ask yourself if the content is for the National or Opportunity Scholars, or for both. Also, to help avoid confusion for your fellow scholars, when making a post or asking a scholarship-specific question, please include the line “For Opportunity Scholars” before your content. If a post is for everyone, no need to include this line. Click “Join” and enter the code word given via email so that you can be approved. 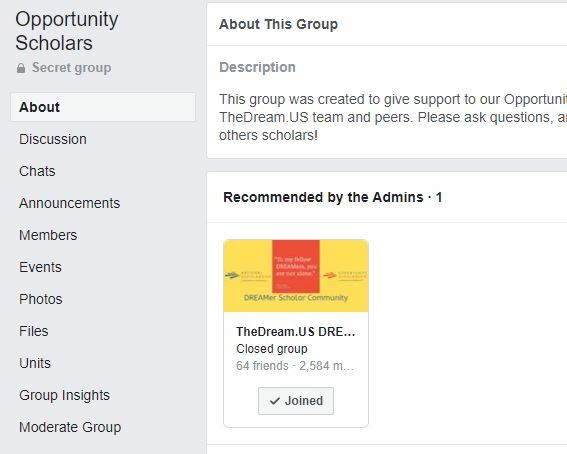 Note: We will eliminate the current Opportunity FB Group at the end of January once all Opportunity Scholars have joined TheDream.US DREAMer Scholar Community Group.